Ballymore saddles up runners in the last three races at Caulfield on Wednesday and hopefully we will be cheering on some midweek winners. Kicking off our day is Oneman Wolfpack who takes his place in the sixth event, the Sportingbet Best Tote Plus 5% Handicap. To be ridden by Jordan Childs the six-year-old was sound first up at Geelong a couple of weeks ago and whilst he has progressed nicely since he is still a run away from his best. "We do expect him to run a better race," Michael Moroney said, "but he will be improved again" he said of the Iglesia gelding whose best form is over longer trips. Next up for Ballymore is Guinot International Handicap contestant Mrs Hadlee (pictured) who certainly deserves a win having finished in the placings all three runs this campaign. Drawn out, Mrs Hadlee has been aided by a few early scratchings bringing her in a bit and Moroney is hopeful that a change of gear - the addition of blinkers - will see her find all the more. "We will ride her a bit differently," he said, adding that the 1300m race "looks a winnable one for her." Space is the third of our Caulfield trio, due to line up in the Le Pine Funerals Handicap. Drawn nicely in barrier three for Damian Lane, the lightly raced four-year-old has not been far away at two runs back from a spell and is nicely primed for a rise in distance. "He is getting fitter now," said Moroney, adding that "it looks an ideal race for him." "It is the first time this campaign we have headed to a race with a bit of confidence." On Thursday we head to Bendigo with a couple of nice horses kicking off with Jemerica in the McCaig Air Conditioning F&M 0 - 64 Handicap. A filly with plenty of natural ability, the daughter of Captain Rio is having her first run since the spring and she has pleased us with the way she has come on. "She won a recent jump-out very easily," Moroney enthused, describing the three-year-old as "a very fast filly." 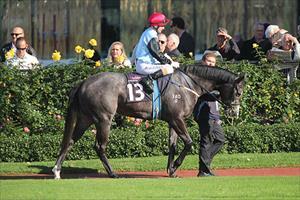 An easy winner at her Seymour debut last August, Jemerica is expected to prove "hard to beat." Sunset Magic in the Centrebet Stayers Challenge Heat 4 also looks a decent chance - ready for her first crack at 2400m. Being a daughter of Zabeel she is bred to relish a trip and she looked good winning her maiden over 2000m at Caulfield a couple of weeks ago. "She has trained on really well and the form around her is holding up well," Moroney said.